ComVu's PocketCaster live video webcast service allows bloggers, citizen reporters, family members, friends and corporate professionals to broadcast live events to their online communities right from their cellphones. Here's how it works: after getting the PocketCaster software on your suitable smartphone, find your video subject (see use of displacement booths below). Then, notify viewers by sending a webcast link generated by ComVu. 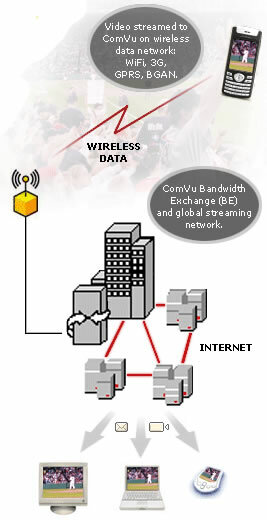 Upon receipt of your video stream, ComVu allocates bandwidth and streams are propagated to your audience across the globe. Viewers can use PCs or Macs, mobile devices and even ITV set-top boxes. In his 1990 novel Earth, science fiction writer David Brin wrote about a very similar service employed by many people, especially senior citizens. Many seniors wore True-Vu goggles, which videotaped whatever the wearer could see, and then immediately uploaded it to a network where it could be viewed by anyone. Read more about it at plusmo via therawfeed, or at the ComVu PocketCaster website. Now anyone can stream video around the world.